One of the cool things about vision boarding is that your vision board can literally be anything. UPDATE: I wrote a book! And it’s all about vision boarding, goal setting, and getting things done. You can order your copy on Amazon. Once you get it, be sure to come join me in my private Make Anything Happen Facebook Group! I think we often picture a vision board as giant board on our wall, covered in pictures of everything we want in our lives, but that’s not really what it has to be like (it certainly CAN be that way, though…but don’t get hung up on that one idea of what a vision board should be). I’ve put together some vision board topics to inspire you to think outside the box and create a vision board (or boards) that truly represents you. 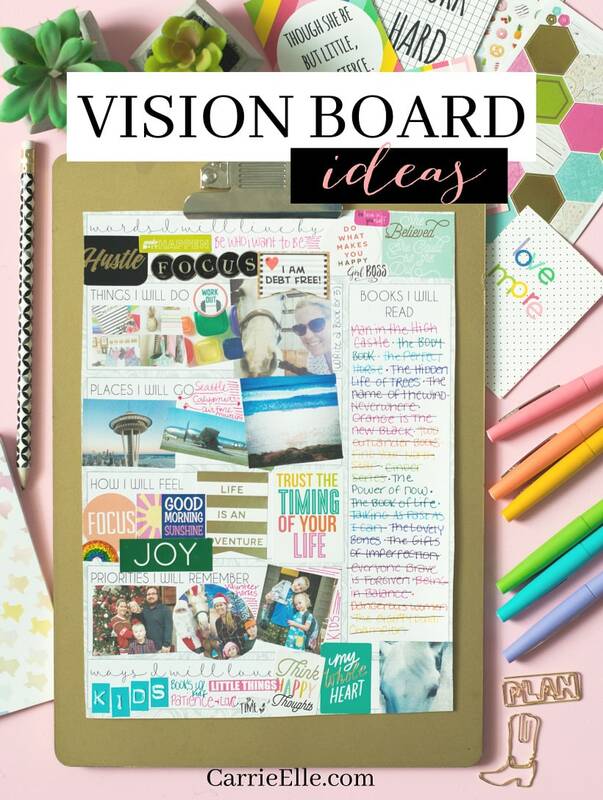 My current vision board is a piece of paper that I keep in the back of my planner (you can download a copy of the printable vision board template I use here). I also do a mini vision board in my planner every month. Nothing fancy…I just write out some things I want to accomplish, a few priorities for the month, and add some cute stickers and call it a day (and yes, watching Titanic is totally appropriate vision board material, y’all!). I even have a little vision board card that I keep clipped into my planner to remind me of one of my Very Important Big Picture Goals (to be debt-free!). 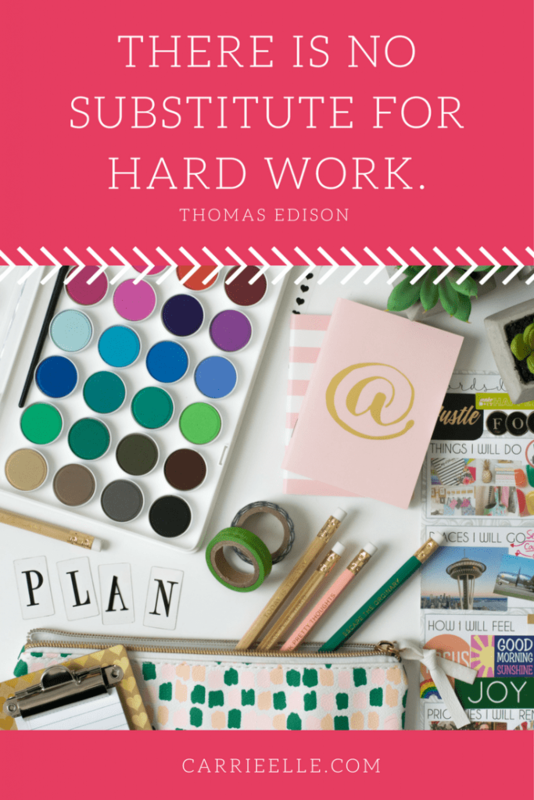 Pull from these vision board topic ideas to inspire you when you feel stuck. 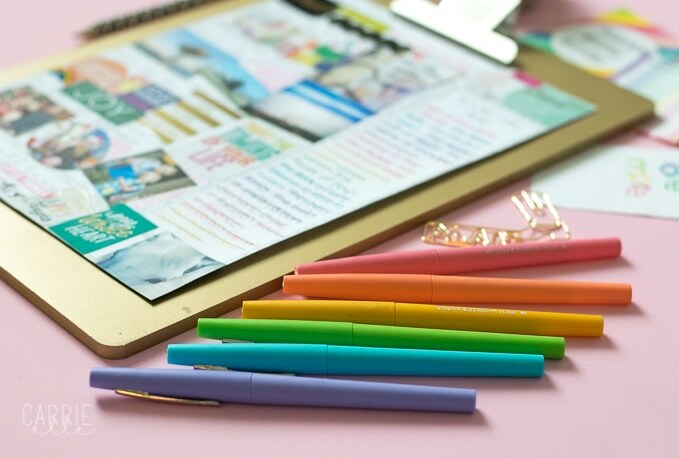 But first, a couple notes about how to make a vision board work for you. It’s one thing to make the vision board – it’s another thing to act on it and accomplish those goals! When you have a goal or dream in mind, think about what that looks like and how it feels. Create the vision board around those feelings. Look at it frequently. But that won’t be enough – you’ll also want to have an action plan in place! Use this printable goal planning page to work up your plan and to keep in touch with your goals. Remember that wanting something is easy, but you’re going to have to put in the work! OK – here are those vision board ideas you’ve been waitng for! 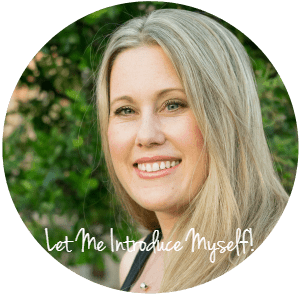 You can see all of my vision board content (printables and how-tos) here. Also be sure to join us on Facebook for lots of vision boarding, goal setting, and planning tools and inspiration. And I think you’ll love the posts below, too! So glad she likes them!! 🙂 You’re very welcome!